Gold has been zigzagging up and down for all of 2017. This erratic performance brings a measure of uncertainty, but – in a way – it also increases confidence in our long-term forecast. 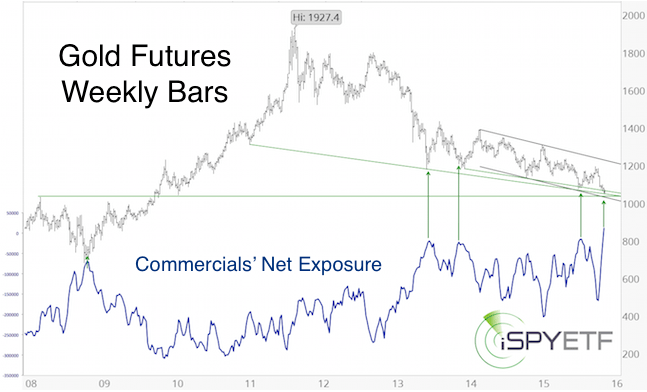 Starting in November 2015, the Profit Radar Report expected a sizeable gold rally. 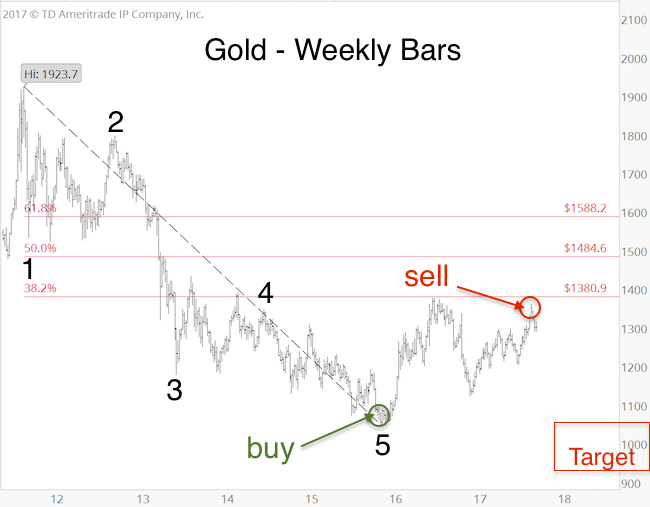 The November 30, 2015 Profit Radar Report published the chart below, which shows gold at quadruple support and record bullish smart money hedgers. An ideal setup for a rally (gold’s final low occurred on December 3, 2015 at 1,045). The second chart shows the Elliott Wave Theory (EWT) labeling we’ve been following for the past years. According to EWT, the first wave (comprised of five sub-waves) of the bear market ended in December 2015. The rally since is a counter trend move. Common Fibonacci target levels for this counter trend rally are 1,381, 1,485 and 1,588. Counter trends are generally more choppy and less predictable, which is true of the rally from December 2015 to September 2017 (this increases confidence in our forecast). 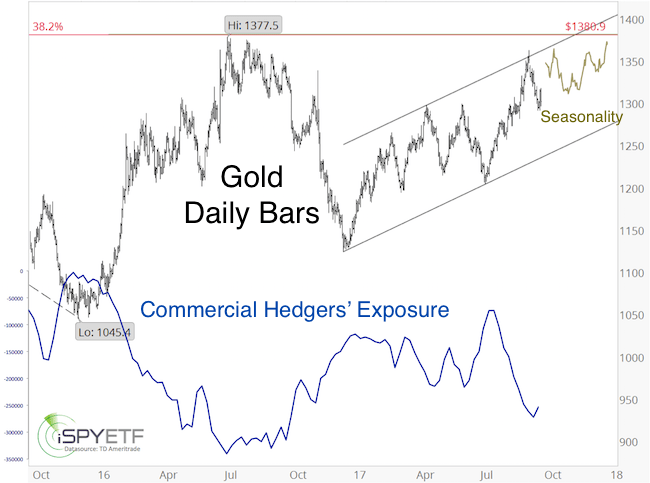 Since we were looking for a move above 1,382, the Profit Radar Report issued a buy signal for gold and gold ETFs like the SPDR Gold Shares (GLD) in November 2015 (gold at 1,088), and in August 2017 (gold at 1282). On September 8, 2017 gold became overbought and touched the top of the black trend channel. Smart money hedgers (which were record bullish at the December 2015 low) turned significantly more bearish (see daily chart). For those reasons, the Profit Radar Report issued a sell signal on September 5, 2017. We don’t have a down side target for the current pullback (yet), but the lack of a bearish RSI-divergence at the September 8 high and failure to reach or exceed Fibonacci resistance at 1,381 suggests gold will take another stab at new recovery highs. The daily chart insert illustrates gold seasonality for the remainder of 2017. 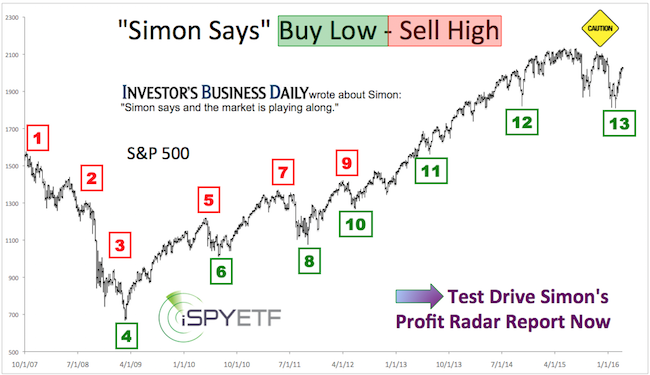 The Profit Radar Report will continue to monitor technicals, Elliott Wave patterns, sentiment, seasonality and cycles to confirm (or invalidate) our preferred forecast and spot low-risk buy or sell entries. S&P 500 Update: Top or Not? The last S&P 500 update outlined why 2,500+/- has been our up side target for over a year. Our view has been that S&P 2,500+/- is not the target for a major top, but it should lead to a 5-10% correction. Barron’s rates iSPYETF as “trader with a good track record” and Investor’s Bussines Daily says “When Simon says, the market listens. New Highs! Top or Not? On Tuesday, the S&P surpassed the August 8 all-time high. In terms of Elliott Wave Theory, this high could be wave b of an ongoing wave 4 correction or wave 5 of wave 3, which would lead to the wave 4 correction (other options are possible, but those are the two most likely). This article explains how and why Elliott Wave Theory has been such a valuable indicator. 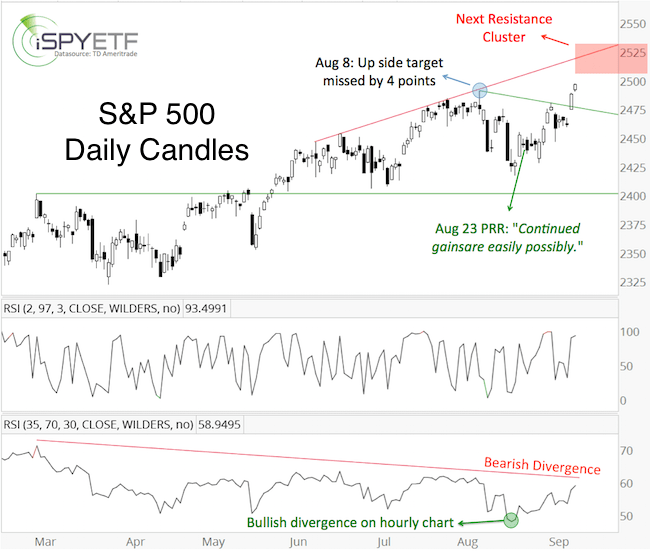 The S&P 500 is nearing overbought, there is a bearish RSI divergence on the daily chart and seasonality is soon hitting a weak spot. However, our reliable liquidity indicator (which has an incredible track record when it comes to sniffing out major tops) confirmed Tuesday’s new S&P highs. The next inflection range spans from 2,500 – 2,540. Our working assumption is that the 5-10% correction will start then. Our major market top indicators strongly suggests that the next correction will only be temporary and followed by new highs. Continued analysis, with down side targets and buy/sell signals are provided via the Profit Radar Report.